A 2011 attack breaks preimage resistance for 57 out of 80 rounds of SHA-512, and 52 out of 64 rounds for SHA-256. Pseudo-collision attack against up to 46 rounds of SHA-256. SHA-256 and SHA-512 are novel hash functions computed with 32-bit and 64-bit words, respectively. They use different shift amounts and additive constants, but their structures are otherwise virtually identical, differing only in the number of rounds. SHA-224 and SHA-384 are simply truncated versions of SHA-256 and SHA-512 respectively, computed with different initial values. SHA-512/224 and SHA-512/256 are also truncated versions of SHA-512, but the initial values are generated using the method described in Federal Information Processing Standards (FIPS) PUB 180-4. SHA-2 was published in 2001 by the National Institute of Standards and Technology (NIST) a U.S. federal standard (FIPS). The SHA-2 family of algorithms are patented in US patent 6829355. The United States has released the patent under a royalty-free license. SHA-256 and SHA-512, and, to a lesser degree, SHA-224 and SHA-384 are prone to length extension attacks, rendering it insecure for some applications. It is thus generally recommended to switch to SHA-3 for 512-bit hashes and to use SHA-512/224 and SHA-512/256 instead of SHA-224 and SHA-256. This also happens to be faster than SHA-224 and SHA-256 on x86-64 processor architecture, since SHA-512 works on 64-bit instead of 32-bit words. The bitwise rotation uses different constants for SHA-512. The given numbers are for SHA-256. is addition modulo 232 for SHA-256, or 264 for SHA-512. With the publication of FIPS PUB 180-2, NIST added three additional hash functions in the SHA family. The algorithms are collectively known as SHA-2, named after their digest lengths (in bits): SHA-256, SHA-384, and SHA-512. The algorithms were first published in 2001 in the draft FIPS PUB 180-2, at which time public review and comments were accepted. In August 2002, FIPS PUB 180-2 became the new Secure Hash Standard, replacing FIPS PUB 180-1, which was released in April 1995. The updated standard included the original SHA-1 algorithm, with updated technical notation consistent with that describing the inner workings of the SHA-2 family. In February 2004, a change notice was published for FIPS PUB 180-2, specifying an additional variant, SHA-224, defined to match the key length of two-key Triple DES. In October 2008, the standard was updated in FIPS PUB 180-3, including SHA-224 from the change notice, but otherwise making no fundamental changes to the standard. The primary motivation for updating the standard was relocating security information about the hash algorithms and recommendations for their use to Special Publications 800-107 and 800-57. Detailed test data and example message digests were also removed from the standard, and provided as separate documents. In January 2011, NIST published SP800-131A, which specified a move from the then-current minimum of 80-bit security (provided by SHA-1) allowable for federal government use until the end of 2013, to 112-bit security (provided by SHA-2) being both the minimum requirement (starting in 2014) and the recommended security level (starting from the publication date in 2011). In March 2012, the standard was updated in FIPS PUB 180-4, adding the hash functions SHA-512/224 and SHA-512/256, and describing a method for generating initial values for truncated versions of SHA-512. Additionally, a restriction on padding the input data prior to hash calculation was removed, allowing hash data to be calculated simultaneously with content generation, such as a real-time video or audio feed. Padding the final data block must still occur prior to hash output. In July 2012, NIST revised SP800-57, which provides guidance for cryptographic key management. The publication disallowed creation of digital signatures with a hash security lower than 112 bits after 2013. The previous revision from 2007 specified the cutoff to be the end of 2010. In August 2012, NIST revised SP800-107 in the same manner. The NIST hash function competition selected a new hash function, SHA-3, in 2012. 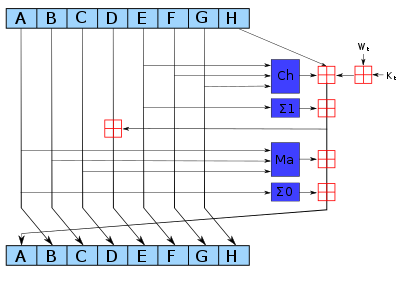 The SHA-3 algorithm is not derived from SHA-2. SHA-256 partakes in the process of authenticating Debian software packages and in the DKIM message signing standard; SHA-512 is part of a system to authenticate archival video from the International Criminal Tribunal of the Rwandan genocide. SHA-256 and SHA-512 are proposed for use in DNSSEC. Unix and Linux vendors are moving to using 256- and 512-bit SHA-2 for secure password hashing. Several cryptocurrencies like Bitcoin use SHA-256 for verifying transactions and calculating proof of work or proof of stake. The rise of ASIC SHA-2 accelerator chips has led to the use of scrypt-based proof-of-work schemes. The SHA-2 functions were not quickly adopted initially, despite better security than SHA-1. Reasons might include lack of support for SHA-2 on systems running Windows XP SP2 or older and a lack of perceived urgency since SHA-1 collisions had not yet been found. The Google Chrome team announced a plan to make their web browser gradually stop honoring SHA-1-dependent TLS certificates over a period from late 2014 and early 2015. Similarly, Microsoft announced that Internet Explorer and Edge would stop honoring public SHA-1-signed TLS certificates from February 2017. Mozilla disabled SHA-1 in early January 2016, but had to re-enable it temporarily via a Firefox update, after problems with web-based user interfaces of some router models and security appliances. For a hash function for which L is the number of bits in the message digest, finding a message that corresponds to a given message digest can always be done using a brute force search in 2L evaluations. This is called a preimage attack and may or may not be practical depending on L and the particular computing environment. The second criterion, finding two different messages that produce the same message digest, known as a collision, requires on average only 2L/2 evaluations using a birthday attack. In the case of document signing, an attacker could not simply fake a signature from an existing document—the attacker would have to produce a pair of documents, one innocuous and one damaging, and get the private key holder to sign the innocuous document. There are practical circumstances in which this is possible; until the end of 2008, it was possible to create forged SSL certificates using an MD5 collision which would be accepted by widely used web browsers. Increased interest in cryptographic hash analysis during the SHA-3 competition produced several new attacks on the SHA-2 family, the best of which are given in the table below. Only the collision attacks are of practical complexity; none of the attacks extend to the full round hash function. At FSE 2012, researchers at Sony gave a presentation suggesting pseudo-collision attacks could be extended to 52 rounds on SHA-256 and 57 rounds on SHA-512 by building upon the biclique pseudo-preimage attack. Implementations of all FIPS-approved security functions can be officially validated through the CMVP program, jointly run by the National Institute of Standards and Technology (NIST) and the Communications Security Establishment (CSE). For informal verification, a package to generate a high number of test vectors is made available for download on the NIST site; the resulting verification, however, does not replace the formal CMVP validation, which is required by law for certain applications. As of December 2013[update], there are over 1300 validated implementations of SHA-256 and over 900 of SHA-512, with only 5 of them being capable of handling messages with a length in bits not a multiple of eight while supporting both variants. Hash values of an empty string (i.e., a zero-length input text). Pseudocode for the SHA-256 algorithm follows. Note the great increase in mixing between bits of the w[16..63] words compared to SHA-1. The computation of the ch and maj values can be optimized the same way as described for SHA-1. the output is constructed by omitting h7. the shift and rotate amounts used are different. the output is constructed by omitting h6 and h7. t values 224 and 256 are especially mentioned as approved. The SHA-512/t IV generation function evaluates a modified SHA-512 on the ASCII string "SHA-512/t", substituted with the decimal representation of t. The modified SHA-512 is the same as SHA-512 except its initial values h0 through h7 have each been XORed with the hexadecimal constant 0xa5a5a5a5a5a5a5a5. Sample C implementation for SHA-2 family of hash functions can be found in RFC 6234. In the bitwise operations column, "Rot" stands for rotate no carry, and "Shr" stands for right logical shift. All of these algorithms employ modular addition in some fashion except for SHA-3. More detailed performance measurements on modern processor architectures are given in the table below. The performance numbers labeled 'x86' were running using 32-bit code on 64-bit processors, whereas the 'x86-64' numbers are native 64-bit code. While SHA-256 is designed for 32-bit calculations, it does benefit from code optimized for 64-bit processors on the x86 architecture. 32-bit implementations of SHA-512 are significantly slower than their 64-bit counterparts. Variants of both algorithms with different output sizes will perform similarly, since the message expansion and compression functions are identical, and only the initial hash values and output sizes are different. The best implementations of MD5 and SHA-1 perform between 4.5 and 6 cycles per byte on modern processors. Testing was performed by the University of Illinois at Chicago on their hydra8 system running an Intel Xeon E3-1275 V2 at a clock speed of 3.5 GHz, and on their hydra9 system running an AMD A10-5800K APU at a clock speed of 3.8 GHz. The referenced cycles per byte speeds above are the median performance of an algorithm digesting a 4,096 byte message using the SUPERCOP cryptographic benchmarking software. The MiB/s performance is extrapolated from the CPU clockspeed on a single core; real-world performance will vary due to a variety of factors. ^ a b c Dmitry Khovratovich, Christian Rechberger & Alexandra Savelieva (2011). "Bicliques for Preimages: Attacks on Skein-512 and the SHA-2 family" (PDF). IACR Cryptology ePrint Archive. 2011:286. ^ a b c Mario Lamberger & Florian Mendel (2011). "Higher-Order Differential Attack on Reduced SHA-256" (PDF). IACR Cryptology ePrint Archive. 2011:37. ^ "On the Secure Hash Algorithm family" (PDF). Archived from the original (PDF) on 2016-03-30. ^ "Licensing Declaration for US patent 6829355". Retrieved 2008-02-17. ^ Wong, David. "Maybe you shouldn't skip SHA-3". www.cryptologie.net. ^ "FIPS 180-2 with Change Notice 1" (PDF). csrc.nist.gov. ^ "NIST.gov – Computer Security Division – Computer Security Resource Center". ^ "NIST Selects Winner of Secure Hash Algorithm (SHA-3) Competition". Retrieved 24 February 2015. ^ "Debian codebase in Google Code". Archived from the original on November 7, 2011. Retrieved 2011-11-08. ^ "What Is SHA-256 And How Is It Related to Bitcoin? - Mycryptopedia". Mycryptopedia. 2017-09-21. Retrieved 2018-09-17. ^ National Institute on Standards and Technology Computer Security Resource Center, NIST's Policy on Hash Functions Archived 2011-06-09 at the Wayback Machine, accessed March 29, 2009. ^ "Secure Hashing". NIST. Archived from the original on 2011-06-25. Retrieved 2010-11-25. ^ "Overview of Windows XP Service Pack 3" (PDF). Microsoft Corporation. Archived from the original (PDF) on May 30, 2008. ^ Eric Mill. "SHAAAAAAAAAAAAA". SHAAAAAAAAAAAAA.com. ^ "An update to our SHA-1 deprecation roadmap – Microsoft Edge Dev BlogMicrosoft Edge Dev Blog". blogs.windows.com. Retrieved 2016-11-28. ^ Somitra Kumar Sanadhya & Palash Sarkar (2008). "New Collision Attacks Against Up To 24-step SHA-2" (PDF). IACR Cryptology ePrint Archive. 2008:270. ^ Kazumaro Aoki; Jian Guo; Krystian Matusiewicz; Yu Sasaki & Lei Wang (2009). Preimages for step-reduced SHA-2. Advances in Cryptology – ASIACRYPT 2009. Lecture Notes in Computer Science. 5912. Springer Berlin Heidelberg. pp. 578–597. doi:10.1007/978-3-642-10366-7_34. ISBN 978-3-642-10366-7. ISSN 0302-9743. ^ Jian Guo; San Ling; Christian Rechberger & Huaxiong Wang (2010). Advanced meet-in-the-middle preimage attacks: First results on full Tiger, and improved results on MD4 and SHA-2 (PDF). Advances in Cryptology – ASIACRYPT 2010. Lecture Notes in Computer Science. 6477. Springer Berlin Heidelberg. pp. 56–75. doi:10.1007/978-3-642-17373-8_4. ISBN 978-3-642-17373-8. ISSN 0302-9743. ^ Florian Mendel; Tomislav Nad; Martin Schläffer (2013). Improving Local Collisions: New Attacks on Reduced SHA-256. Advances in Cryptology – EUROCRYPT 2013. Lecture Notes in Computer Science. 7881. Springer Berlin Heidelberg. pp. 262–278. doi:10.1007/978-3-642-38348-9_16. ISBN 978-3-642-38348-9. ISSN 0302-9743. ^ Maria Eichlseder and Florian Mendel and Martin Schläffer (2014). "Branching Heuristics in Differential Collision Search with Applications to SHA-512" (PDF). IACR Cryptology ePrint Archive. 2014:302. ^ Christoph Dobraunig; Maria Eichlseder & Florian Mendel (2016). "Analysis of SHA-512/224 and SHA-512/256" (PDF). ^ "SHS Validation List". NIST. 2017-06-16. Archived from the original on 2017-06-17. ^ "SUPERCOP". Retrieved 24 February 2015. RFC 3874: "A 224-bit One-way Hash Function: SHA-224"